The most important thing in a good Tofu is the ingredients and the technology to preserve its freshness - the finest soya bean, the best pasteurized technology and the purest water. Unicurd only uses all natural ingredients to craft the Tofu you eat. Each ingredient is carefully chosen, checked and then pampered at every stage of the manufacturing process. This is important to ensure only freshest high grade tofu are enjoyed by the consumer. Unicurd takes great care over the choice of their raw materials and also invest in the most advanced technology to constantly improve the product quality and developed most efficient production methods. Our passion is in Tofu. That is the secret of how we made the freshest and best tasting tofu. Ever wonder why Unicurd™ Tofu tastes so good? 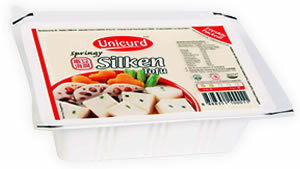 Freshest taste sealed in pack using the Best pastuerized technology and most hygiene production methods. Only natural ingredients of the best grade are used in all Unicurd™ Tofu. For e.g Unicurd®™ Egg tofu uses only premium grade egg to the proportion of 1 egg to 1 tube of tofu to allow the best tasting egg tofu ever experienced by the consumer.